As we all know, Tyrannosaurus rex is the world’s No. 1 favorite dinosaur, so we at the Houston Museum of Natural Science are as pleased as punch over our specimen Wyrex, a truly splendid fossil that will help fill out the Cretaceous zone of the new Hall of Paleontology. Wyrex will join our casts of Stan, an adult rex, and Bucky, a teenage Tyrannosaurus, in the new hall next week. Our Wyrex gets its name for Montana rancher Don Wyrick, who spotted bones eroding out of river sediments that were deposited about 66 million years ago during the Lancian Age — the last slice of dinosaur history before the great die-off. Of course, T. rexes are famous for their bone-crushing bite and the old question of whether they were cowardly scavengers or fearless predators. 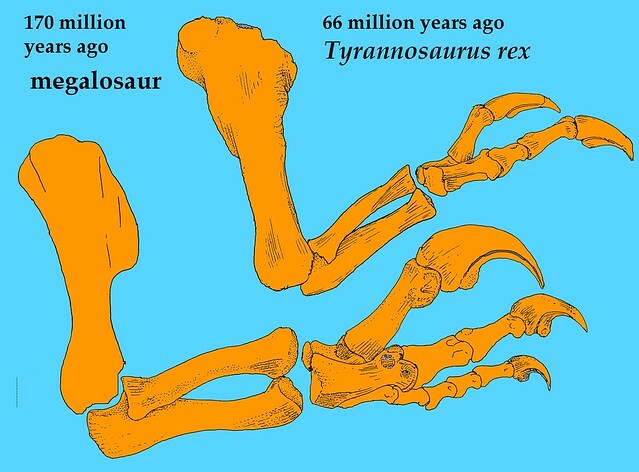 But equally fascinating is the century-old puzzle of tyrannosaur digits. (Fingers, not phone numbers). Theory No. 1: Some scientists say: T. rex was a waddling stumblebum, so slow that you could easily escape it at an amble. Let’s look at the hard (fossilized) data. Our database includes all the maxi-fauna today — land creatures who grow to a ton or more. We find that slow walkers, like elephants, have short shins and very short ankles compared to their thigh length. A charging African elephant, for example, hits 22 miles per hour. 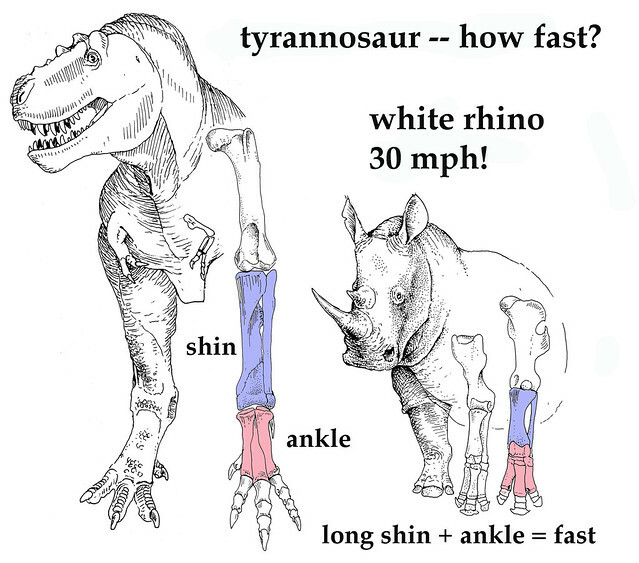 Faster large animals, such as rhinos (who get almost as heavy as elephants) are equipped with more length in shin and ankle. An angry white rhino easily surpasses 30 miles per hour. A rhino, a fast big critter, next to a T. rex. Notice how long the shin and ankle are in the rex. Here’s another way to test the slow-rex theory. 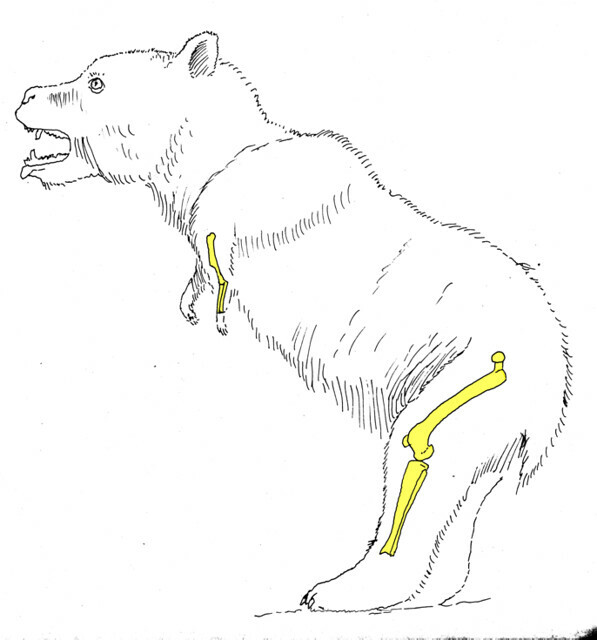 Fast animals today — small, medium and large — have compact ankles. The long ankle bones, called “metapodials,” are tightly bound to each other so they make one strong unit. Slow walkers like elephants have loosely constructed metapodials that let the entire ankle spread out. Check out our Wyrex’s ankle. Tight or loose? TIGHT! There are three long ankle bones, and the inner and outer bones hug the middle bone so tightly that the whole ankle works as one bony unit. That is not an elephant-style spreading foot. Our three rexes, Stan, Bucky and Wyrex, tell us most emphatically that their species were not slowpokes. Theory No. 2: Some scientists say that T. rex fingers were powerful meat hooks. Wyrex’s hand is worth pondering. In the new hall you’ll be able to stand very close to the bones, so you can compare your arm and fingers to his. At first glance, the rex mitt does seem as strong as a grizzly bear’s. But wait … in nature, what matters is how strong your hand is compared to the rest of your body. Wyrex was 10 times as heavy as the average grizzly bear. That means the Wyrex arm is 10 times weaker relative to his body weight than the bear’s. Check out the measly arms on this Grizzly bear proportioned like our Wyrex. Now analyze the Wyrex claws. Are they as big and hooked as hand claws from earlier meat-eating dinos? Nope. Our Acro (Acrocanthosaurus) is a bit smaller in body weight than Wyrex but has much heavier, sharper and more hooked claws. T. rex evolved from an ancestor shaped like Acrocanthosaurus, who evolved from something like the Jurassic megalosaurs. If claw strength really was important, why did evolution make the rex claws weaker? Then there’s the famous two-fingered salute. 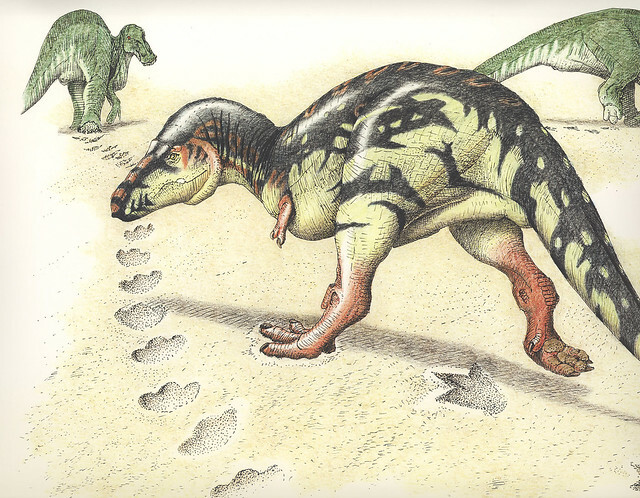 Most dino carnivores had three strong fingers — thumb, index finger and middle finger. Allosaurs from the Jurassic are built that way, and so are the acrocanthosaurs from the Early Cretaceous. So are all the raptors. One example? Our cast of Deinonychus, the raptor who inspired Jurassic Park. Wyrex has a near-perfect hand. But how many fingers does he have? Two — thumb and index. And the finger bones are far skinnier than what you see in an allosaur or an acro. All T. rexes and their close cousins, the gorgosaurs, were weakly two-fingered. A rex arm next to a Jurassic meat-eating megalosaur. How and why did evolution clip off that third finger? Wyrex shows us. Stare at the outer side of the hand. You’ll see an ultra-thin bone crowded against the index finger. That’s a remnant of the third digit. It was retained because some major muscles attach to the base of the third finger, muscles that are needed to rotate the whole hand sideways. Other rex specimens probably also had that remnant of the third finger, but lost the bone after death when scavengers nibbled away the muscles. 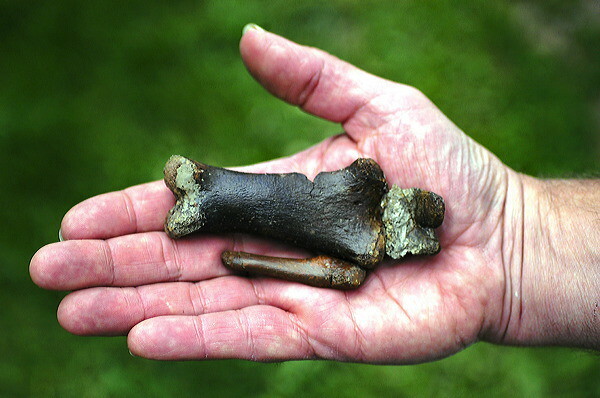 The muscle-attachment on the finger remnant tells us that some sideways movement was still important in Wyrex, but it was a delicate movement — not the brute action of a meat-hook. Theory No. 3: In 1905 one famous scientist theorized that rex fingers were for gentle…tickling!? It sounds weird at first. However, that scientist was none other than Professor Henry Fairfield Osborn, the New York paleontologist who found the first T. rex and gave the species its name. Osborn had great insights into extinct animals. He had museum-smarts AND zoo-smarts. He was on the board of the Bronx Zoo, and he observed live animals. He knew that a giant predator needed more than powerful jaws for killing prey and long limbs for chasing it; predators needed a way to attract desirable mates so they could make healthy, desirable offspring. The problem: If you are a 10,000-pound rex who can bite another dinosaur in half in one chomp, how do you express tender, romantic feelings? The answer: Tickling. Many animals today use a small finger or toe to stroke their loved ones. Critters with fur or feathers spend much time grooming their friends and mates with delicate strokes of claw-tips. Grooming renews the bond between male and female, between parent and youngster, and between pack-mates in a hunting group. It is a fun fantasy. Think of it: a young mated couple of rexes relaxing after a meal of duck-bill meat, stroking each other’s necks and muzzles, then petting their newly hatched chicks. The fantasy becomes more believable if rexes had fur or feathers. Feathers have been found with many small and medium-sized meat-eating dinos, but up until 2012 no one had excavated a big tyrannosaur with feathery pelage. But in the spring of that year, our Chinese colleagues announced an Early Cretaceous tyrannosaur fossilized with big sections of skin. In the skin were tightly packed feathers — thin, kiwi-like feathers — up to a foot and a half long. The Chinese species was very similar to what the direct ancestor of later tyrannosaurs must have looked like. The conclusion, then, is that Wyrex, too, probably had feathers. So recent discoveries back up what Professor Osborn said over a century ago: T. rexes had a softer side — literally! An aside — Osborn was not only a superb research scientist, but also a brilliant designer of public exhibits. He was the first to mix skeletons with beautiful murals and sculptures of the extinct beasts in their natural habitat. And he envisioned a fossil exhibition as a series of safaris back into deep time. In other words, Osborn would have loved our new HMNS Hall of Paleontology — and you will, too. Dr. Bakker, this is all FASCINATING!! As far as the purpose of rexes reduced digits, couldn’t that feature simply have evolved as a response to other changes throughout Tyrannosaur development (e.g., increased body size and bite force, and reduced usage of claws during predation/ scavenging)? Do the vestigial third finger and attaching muscles preclude a non-adaptational origin?? Any further insight would be greatly appreciated! individual named Peter Mihalda. Look up his name and you’ll find him. Next Post Help us help you: Name our new paleontological pal and win a guided tour of the new Hall of Paleontology!